TOKYO – October 7, 2009: Mitsubishi Motors Corporation will be showing a total of 16 cars at the 41st Tokyo Motor Show in October. Among cars on display at the Mitsubishi Motors stand include two concept cars developed to a “The EV: Its dawn and future” theme: the Mitsubishi Concept PX-MiEV and the i-MiEV CARGO, the i-MiEV new-generation electric vehicle for which the company is currently accepting pre-orders for the start of sales to individual customers in April 2010; and 10 current production vehicles that qualify for eco-car tax incentives in Japan. The 41st Tokyo Motor Show will be held at the Makuhari Messe in Chiba Prefecture just outside metropolitan Tokyo, open to the public from October 24 through November 4, with Press Days October 21 and 22. Powered by the new Mitsubishi Plug-in Hybrid System, which significantly extends the frequency a hybrid vehicle is driven in EV mode, the Mitsubishi Concept PX*-MiEV returns fuel economy in excess of 50 km/liter. The Mitsubishi Concept PX-MiEV is a new-generation concept car that balances high environmental performance with road performance by utilizing differential motors and Mitsubishi’s all-new S-AWC (Super All Wheel Control), that utilizes E-AYC (Electric-powered Active Yaw Control) which transfers torque to the rear left and right wheels. Other features include Mitsubishi’s cocochi-interior, which provides occupants with a comfortable cabin environment, as well as many of the latest safety technologies. Derived from the production i-MiEV, this concept maximizes the outstanding environmental performance and economic efficiency characteristics that define the EV and at the same time adds a generous amount of rear free space to extend the range of uses to which it can be put by corporate users and self-employed operators in particular. The rear space features space-efficient cubic dimensions to allow the user to exercise their imagination fully in adapting it for whatever use he/she chooses. The result is a concept for an EV that meets user needs for a variety of situations: from business use, where maximum payload space is required, to leisure and other individual owner uses. Solid, Safety, and Simple were the keywords which drove the development of an exterior design suitable for a next-generation crossover that creates simple appearance from which all extraneous elements have been pared and that is free of the “rugged” elements typical in conventional SUVs. The headlamps and rear combination lamps use LED emitters that give the car an innovative and modern appearance as well as delivering better environmental performance with their reduced power consumption. The body uses a newly-developed metal color that gives the car a metal shell-like appearance. Combining elements of both spoke and dish styling, the road wheel design highlights an unprecedented new look to the body as well improving brake cooling and aerodynamic performance. The interior was designed to give an image of an airplane cockpit to improve the driver’s concentration, with an instrument panel that envelops the driver and utilizes seats that keep the passengers firmly in place. In addition, the entire instrument panel and door trim utilize soft LED lighting that express the vehicle’s innovation and refinement. 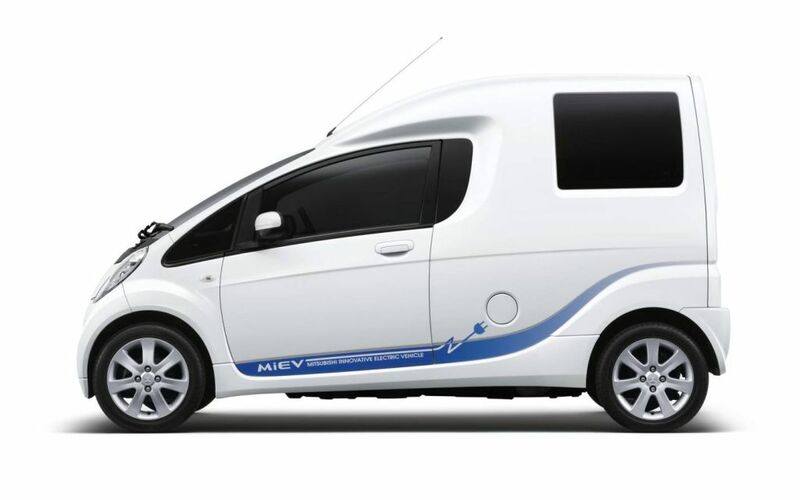 The Mitsubishi Concept PX-MiEV’s front and rear wheels are powered by two permanent magnet synchronous motors and is also fitted with a 1.6L DOHC MIVEC gasoline engine which can power the front wheels as well as work as a generator. In addition, the vehicle comes with the newly-developed Mitsubishi Plug-in Hybrid System in which electronic circuitry automatically switches to the optimum drive mode for different driving conditions and remaining energy in the drive battery to extract maximum efficiency from the electric motors and from the gasoline engine. The Mitsubishi Concept PX-MiEV also utilizes the MiEV OS (MiEV Operating System) which selects the optimum drive mode through integrated control of the EV components and the gasoline engine as well as controls optimum electrical charge and output in response to remaining battery energy through constant monitoring of the drive battery. With these, a pleasing, safe, and comfortable ride is achieved while conserving energy. In addition, to maximize effective use of the drive battery, the vehicle is equipped with a power supply mode that allows the use of some battery power to supply domestic appliances or as an emergency power source in the event of a natural disaster. EV mode At low to middle vehicle speeds the Mitsubishi Concept PX-MiEV’s drive battery powers the front motor using front-wheel drive. When driving on snow, in the rain or in other low surface friction situations where maximum vehicle stability is required, the system automatically switches to four-wheel drive mode by feeding power to the rear wheel motor as well when sensors detect any front wheel slip. Series hybrid mode When the remaining energy in the drive battery falls to a predetermined level the system starts the gasoline engine to generate electricity and automatically switches to the series hybrid mode using the electricity generated to power the motors. In this mode as well, the system switches to four-wheel drive by driving the rear motor depending on driving conditions. Parallel hybrid mode At higher vehicle speeds the car is supported by the gasoline engine which operates more efficiently than the electric motors at high revolutions. In this mode, the gasoline engine also helps drive the wheels. When the driver makes sudden lane changes or other maneuvers requiring greater vehicle stability the system switches to four-wheel drive by bringing in the rear motor to drive the rear wheels, improving stability. In addition when overtaking at higher speeds or in other situations requiring faster acceleration the system switches in both front and rear motors to provide additional power and assist the gasoline engine, providing high acceleration. Regenerative mode When the vehicle is slowing or coasting down a long descending slope the system switches to regenerative mode in which kinetic energy reclaimed from the wheels is stored in the drive battery. Charging mode As with the production i-MiEV, Mitsubishi Concept PX-MiEV features a 3-way battery charging system using either a 100-volt or a 200-volt domestic supply or a high-power quick-charging station. The system also incorporates a Wireless Charging Program feature that allows the owner to start charging the battery or start the air conditioner at a preset time even when away from the vehicle. Power supply mode The Mitsubishi Concept PX-MiEV also subscribes to the “Smart Grid” concept that calls for maximizing the effective use of electrical power and which is currently attracting attention in the fight to combat global warming. 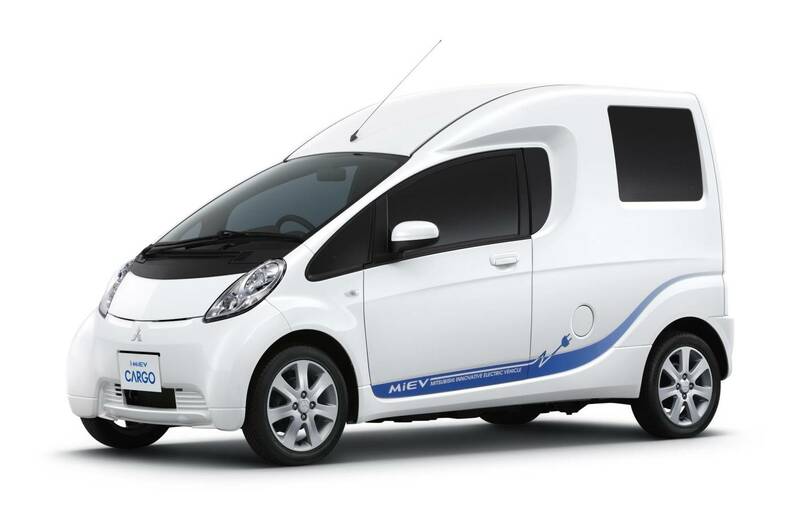 When not on the road the Mitsubishi Concept PX-MiEV allows the owner to store electricity at night and then use that electricity via the normal charging connector to power home appliances during the daytime when domestic electricity consumption is highest. This allows the drive battery to be used as a power source in the event of a natural disaster. Should the electricity left in the battery fall below a predetermined level, the gasoline engine starts up and works as generator to maintain the power supply at a fixed level.|A 100-volt AC auxiliary socket in the rear luggage compartment also allows the electricity stored in the drive battery to be used to power cooking or lighting equipment and other appliances when camping or engaged in other leisure activities. Mitsubishi Concept PX-MiEV uses Mitsubishi’s S-AWC integrated vehicle handling control system which is configured around an E-4WD (Electronically-powered four-wheel drive) system that controls front and rear motor output to deliver the optimum front/rear drive torque split. Under the integrated control of the S-AWC system are E-AYC (Electric-powered Active Yaw Control), which controls left/right torque split at the rear wheels and the degree of deceleration energy recovery, ASC (Active Stability Control) and ABS (Anti-lock Brake System) components. Unlike the AYC system on the Lancer Evolution X which uses a wet multi-plate clutch arrangement, E-AYC uses a differential motor to control rear wheel torque split. The use of the differential motor makes for a high-efficiency system with outstanding response and contributes to the on-demand handling and outstanding vehicle stability that characterizes the S-AWC system. The Mitsubishi Concept PX-MiEV uses a windshield that uses heat-reflecting glass to reduce the amount of heat energy passing through and uses IR- (infrared ray) blocking glass in the door windows. The body paint also incorporates heat-reflective and insulation technology. Inside the vehicle the four seats are individually air conditioned and cabin humidity is regulated. The adoption of these heat load reducing technologies allows efficient climate control while reducing power consumption to the absolute minimum in making for a very comfortable occupant space. The Mitsubishi Concept PX-MiEV showcases several new active safety technologies. The “New Multi-around Monitor” system uses cameras located at strategic points on the body to provide the driver with a combined image of the full perimeter of the vehicle. The combined image is displayed for the driver on a monitor from an overhead view for improved safety around the perimeter of the vehicle. The Mitsubishi Concept PX-MiEV is equipped for the Driving Safety Support System (DSSS (Level II)) currently being promoted by the Japanese National Police Agency. In this advanced vehicle-infrastructure safety support system, an on-board receiver picks up signals transmitted by roadside optical beacons and the system urges the driver to take extra care when other vehicles or pedestrians have been detected by roadside sensors and cameras at intersections and pedestrian crossings. Employing a system that uses wireless technology to ascertain the position of other vehicles and warn the driver when their proximity so requires, the Mitsubishi Concept PX-MiEV also supports the Advanced Safety Vehicle 4 (ASV4) project being promoted by the Road Transport Bureau of the Japanese Ministry of Land, Infrastructure, Transport and Tourism. The vehicle is also fitted with a Dedicated Short Range Communications (DSRC1) system, employing the road-to-vehicle communications capabilities used in Electronic Toll Collection (ETC) to determine the position of the vehicle and whether it is parked or not. The Mitsubishi Concept PX-MiEV is fitted with an electronically-controlled air suspension that gives the driver the choice of three ride height modes – Auto, High, Low – for improved stability over poor surfaces or at high speeds and for easier access to and from the vehicle. The concept also uses a new-generation steering wheel switch and control layout that offers outstanding usability and switch visibility for safer and less stressful driving. Some of the audio, navigation, and climate control switches are located on the steering wheel so that the driver can operate them without having to take a hand off the wheel. Switch operation indicators located in the instrument panel make it quicker and easier for the driver to visually check and control the switch positions. In the Driving Monitor System a camera mounted facing the driver monitors eye movements to determine their level of alertness. If the system detects a decrease in their concentration it issues not only audible but visual and vibrational warnings and also emits a distinctive aroma to alert him/her to the situation.